In honor of the patron saint of fishermen, Our Lady of Peace, dozens of fishermen will take part in the traditional marine pilgrimage with the Peace Torch; the festivities will include cultural, artistic and sports activities. The best traditions strengthen the culture of their people. The Bucerías Patron Saint Festival is a shining example, maintaining the enthusiasm of the participants thanks to its rich religious, social, commercial and touristic value. The festivities begin on January 16th and end on the 24th, the Day of Our Lady of Peace, mother and protector of fishermen, with the marine pilgrimage of the Peace Torch. 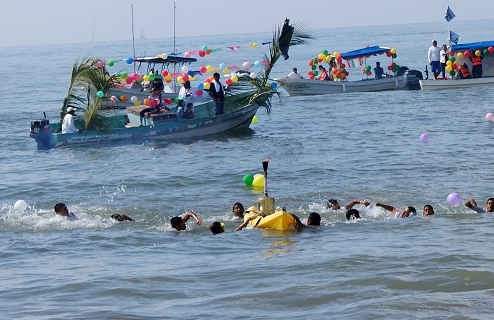 Even though it’s relatively new, perhaps the most representative act of this cultural and religious-themed week is when the fishermen sail from La Cruz de Huanacaxtle to Bucerías and then go by land to take their offering to the Virgin at the Church of Our Lady of Peace and plead for a prosperous year. Different sports, artistic and cultural activities will take place during the festival. Highlights include the coronation of the Festival queen on the first day, as well as the fireworks and the castle, followed by the celebration of the corresponding masses. The commercial sector always sees a spike in sales during these days thanks to the many tourists and other inhabitants of the region that arrive in Bucerías from the approximately 20 surrounding communities. As usual, the local gastronomy will be well represented, as it is a distinguishing feature of the Riviera Nayarit. A fine variety of the beautifully made Nayarit arts and crafts will also be on display, accompanied by the local artisans themselves.